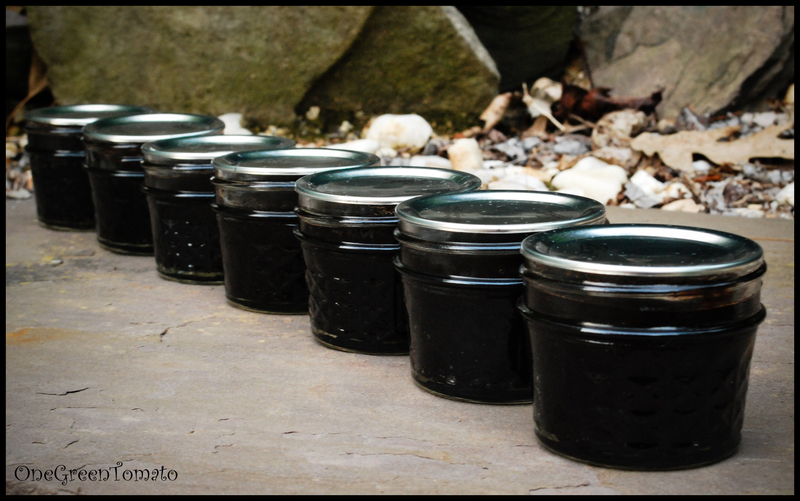 This year I decided to try my hand at making and canning fruit butter. I really really love apple butter, so I assume my taste buds would have the same affection no matter what the fruit. I found a recipe at pickyourown.org, a long time, go-to source of mine. It allowed for several variations in the amount of sugar, which to me is important. The main draw back, however, is that the recipe called for cloves. I am not a fan of cloves, but I am keeping an open mind. Feeling the need to have a back up spice plan I continued searching and stumbled on this recipe found at Food in Jars, which had even less sugar than the aforementioned. Score! For both recipes I pureed my berries in the food processor and then placed them into my slow cooker on high. I added the sugar and lemon juice and turned the heat to low once the mix was hot. I allowed my butter to cook overnight, approximately 8 hours. It is important to keep the lid propped open to allow the steam to escape. A wooden spoon works great! The next morning I added my spices and continued cooking for an additional hour or so. Once I had my desired thickness I turned the slow cooker off and allowed it to cool a bit. I then used my immersion blender to bring the butter to a smooth consistency, ladled it into hot sterilized jars. and processed in a BWB for 5 minutes. After tasting both recipes I’ve come to the conclusion that the cloves are not as distinct as I initially thought they would be. I’m super happy with both flavors but next time I may marry all three spices together and keep to the 2 cup sugar recipe!